The first widespread snowfall of the year that feel late last week brought the Fowled Reality crew high hopes for waterfowling the past week. 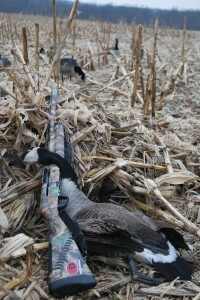 We scattered across location throughout central Illinois on Friday in a scouting effort to find migrating canada geese. Hundred of miles and many phone calls led to next to nothing promising for goose hunting. In areas between I-72 and I-70 we saw very few new birds show up. The local birds in the area stuck to their afternoon feeding routines with the colder weather and recent full moon. As has been the case all season, they either fed in fields that we can't waterfowl hunt, or randomly flew as resident geese always do. 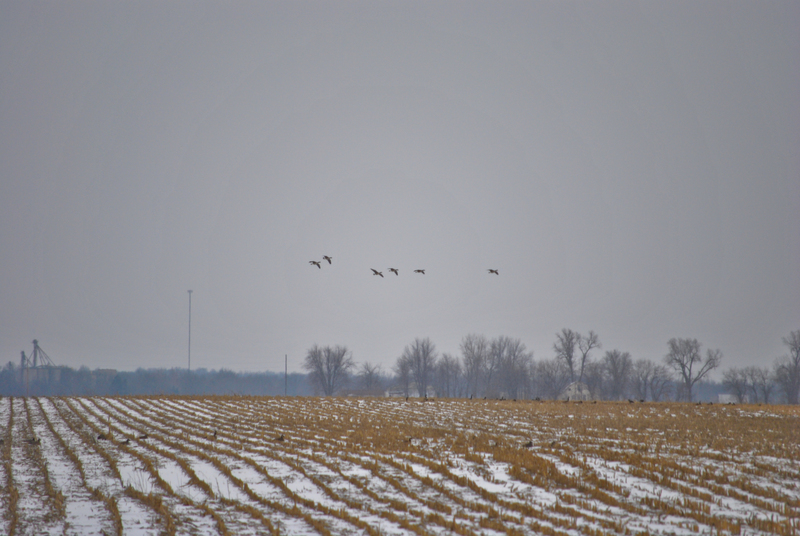 Scott had been seeing some of the locals geese feeding in a chisel plowed corn field that we were able to get access to. They were there 4 nights in a row prior to our scouting mission on Friday. Unfortunately, they never showed to the field Friday so our plans for a Saturday hunt were put aside. Blake and Chris headed to Missouri Saturday morning for a hunt with some guys from Muddy Dog Outdoors for a little goose hunting action in central Missouri. The field we were hunting had tons of birds circling it Friday afternoon. As has been the case with our goose hunting season, none of the geese took flight that day and instead elected to sit on the ice at the local lake or feed on grass on the banks. The one good thing that came out of Saturday was a phone call that the resident geese were back in the field we had access to in central Illinois. There was only 40-50 geese using the field, but we'll take what we can get this year. The Fowled Reality crew got setup shortly afternoon and waited for the geese to repeat their pattern of flying just a quarter mile off the roost to the feeding field. They had now been in the field 4/5 days. We waited and waited only to be outsmarted once again! The birds sat on the ice the entire afternoon. We heard them get vocal at one point during the afternoon as a flock of specklebellies flew over, but that was all the activity of the afternoon. 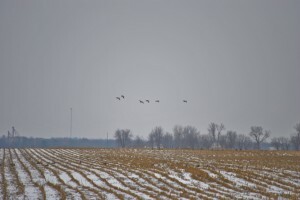 From the reports we read, lots of geese finally crossed the state line from Wisconsin into northern Illinois and great goose hunting success was had by many. Smaller numbers of new geese entered areas just north of I-72 and south of that line very few new geese showed. Over New Year's weekend we had an estimated 3000 geese using the area we hunted this past weekend. They showed without any snow and a slight cool down. They quickly returned north with the warmup the first few days of January. Now that we got snow and some of the coldest temps of the year, they haven't returned. The frustration of the 2011/2012 waterfowl season continues! For more updates on where the goose hunting aciton is hot. 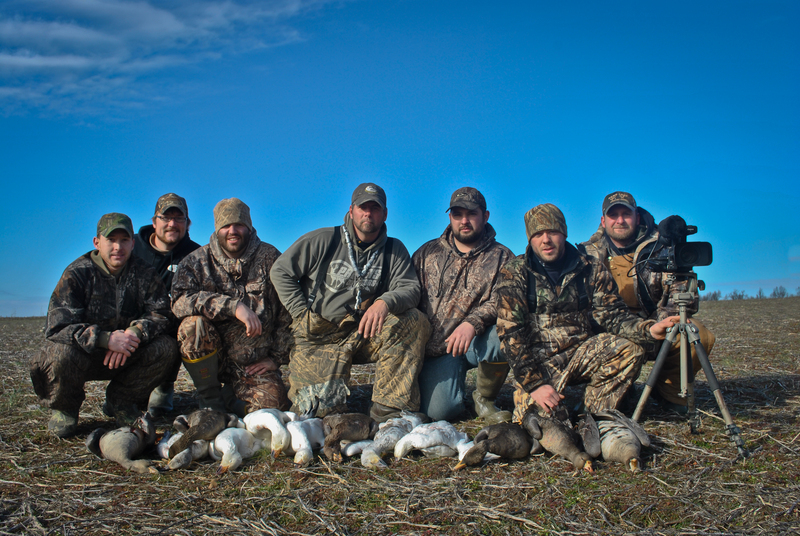 The Fowled Reality crew headed south to meet up with some friends in Southern Illinois this past weekend. It was the south central zone's last weekend of duck season, but with few ducks around, we decided to pass on hunting at home and head south and do a little specklebelly and snow goose hunting in this waterfowl hunting video.. Our buddies Ryne Wade and Scott Madison located a good bunch of geese using a bean field in an area surrounded by a few refuges and a small roost hole. They knocked on some doors, found the owner, and were granted permission to hunt the field. Hunting snow geese with no e-caller during the regular season can be tough, but with a few guys doing some calling, great blind concealment, and correctly placed decoys we were able to have some luck! 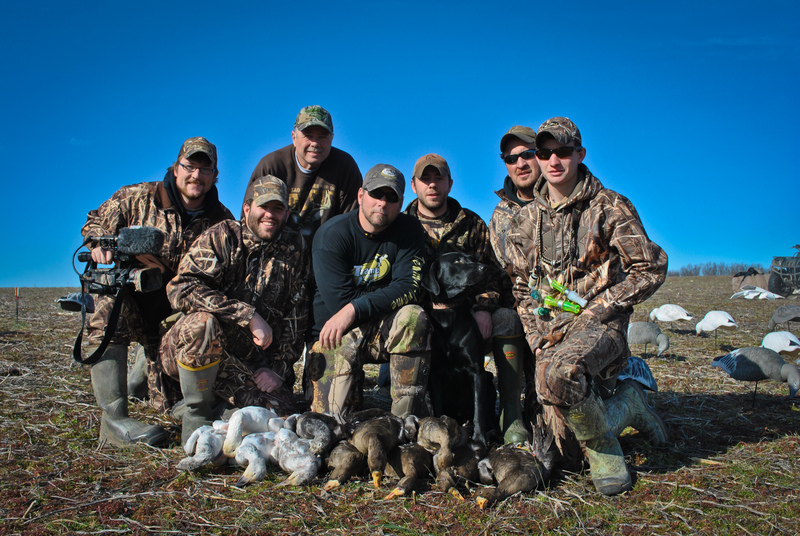 The guys put down 12 snows and 12 specks over the course of the weekend in this waterfowl hunting video. A trailer from the hunts can be seen here. Here is the full waterfowl hunting video. The forecast calls for a sharp drop in temperatures starting tonight and continuing through the next few days. We are finally going to get the cold to link up with the moisture and produce snow to get the waterfowl migration in full swing! Winter weather advisories and winter storm watches have been posted for for parts of Iowa, northern Illinois, and Wisconsin. Three to eight inches of snow is on the way along with sub-freezing temperatures and 30-40 mph northwest winds. Sounds like a good recipe for a waterfowl migration! One to three inches of snow could fall as far south as I-70. The close to the south central waterfowl hunting zone in Illinois passed quietly earlier this week. It started off very well, but quickly went sour shortly into December. There are lots of factors that went into it: spring flooding wiping out a lot of moist soil vegetation, lack of long lasting cold and arctic fronts during the season, and the continued shift west of the Mississippi Flyway. Missouri is doing more for their ducks than Illinois. Naturally they're figuring out where the most food is and that's where they are going. With all that being said, all hope is not lost! 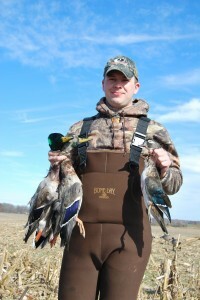 We can still hunt ducks in the south zone of Illinois. An early morning report we received from some friends in southern Illinois is new ducks are already showing up ahead of the latest front. They've already killed 18 birds by 9AM. Expect more fresh ducks to continue to show the next few days with a hard freeze and snow coming! The Fowled Reality crew expects the goose hunting to finally pick up in the coming days. The same front that has the ducks on the move should get the geese active as well! There are hit and miss reports of good numbers from I-72 all the way to Illinois/Wisconsin border. We expect the numbers to increase substantially as the remaining birds in Wisconsin finally get pushed south in the coming days. The question is, just how far south with the go? They need open water to roost and an uncovered food source. The forecast looks like they'll have to travel pretty far south to find an open food source and water should start locking up quickly starting tomorrow. The snow combined with the wind will make scouting throughout the northern 2/3's of Illinois nearly impossible on Thursday, but come Friday it's time to hit the road and see just how far south the honkers are going to travel. We'll be covering a large area from south of I-70 all the way to I-74 in hopes of finding geese. With highs Friday in the low to mid 20's, waterfowl will have to be feeding on hot food rather than the subdivisions and lake grass they've been on so far this season. Combine that with the full moon to look for afternoon feedings. Water is going to lock up fast and should stay that way for the forseeable future! Another system is in the cards early next week which should continue to send the waterfowl migratino southward across portions of the Mississippi Flyway. Good luck this weekend! For waterfowl migration reports from around the country. Late season waterfowl hunting can be tough. As we enter the homestretch of the duck and goose seasons across the US, the birds are educated! Especially in our part of Illinois due to the lack of new birds in close to a month. 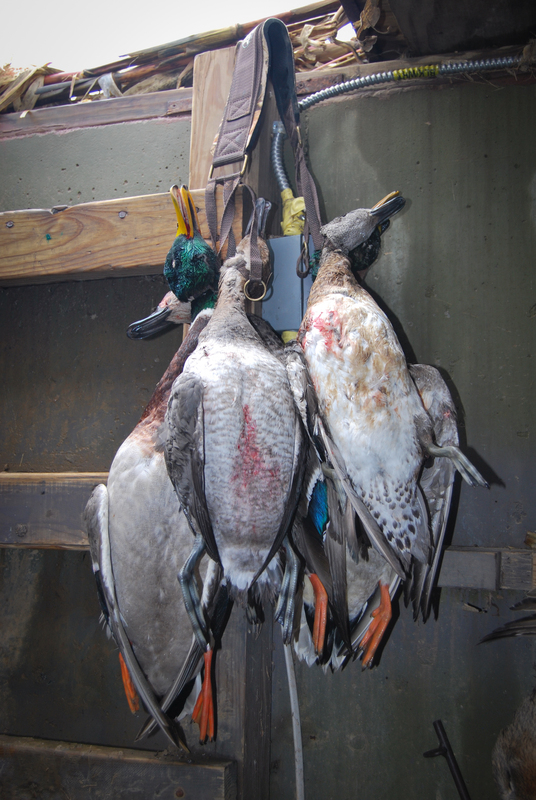 The few birds we do have around have seen every spread known to man and heard every note a duck call can produce. They've been hunted hard since September in Canada. Here are a few tricks that we've used over the past few years to entice leery late season waterfowl into our spread. Hopefully this will improve our and your late season waterfowl hunting. 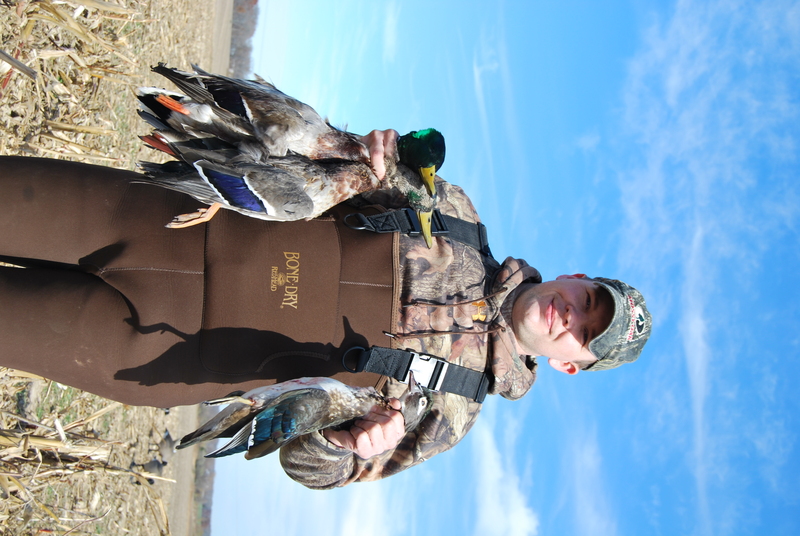 facemask and gloves to stay hidden while waterfowl hunting. Extra stalks on the blind…. spread, especially if other setup in the area continue to run large spreads. The Fowled Reality crew likes to be different! There are days where refuge spreads work awesome, other days it doesn't matter if you have 500 decoys out there. 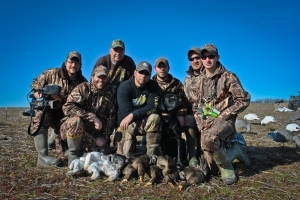 Late season waterfowl hunting is usually characterized by cold weather…..except for this year. When the snow and ice is on, sleep shells are dynamite! It's also beneficial to use shells or full bodies placed directly on the snow. As soon as a bird lands, it'll lay down to melt the snow to gain access to food. 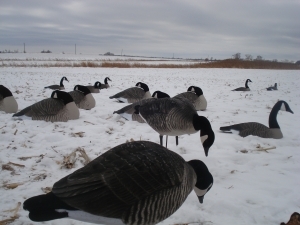 We'll mix in some full bodies on stands, but the majority of our decoys will be placed directly on the snow/ice. We'll also kick the snow around the spread to make it appear as though birds have been moving around feeding in the field. We'll try to disturb the field the most in the kill hole to trick the birds into thinking that is the best spot to feed. 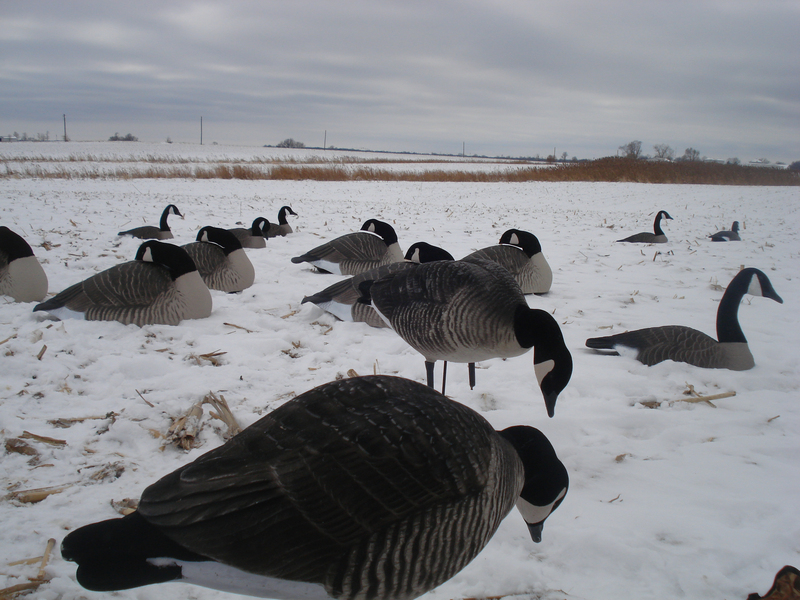 During the coldest days, we'll pack the decoys tight, but on warmer days, we'll space them out more. the decoy spread on their own, then we'll let them do their thing. If they fly by without looking, then we'll start calling to them. If you're lucky enough to get them turned, pay attention to what note they turned on and keep hitting them with it. what they want to hear or if they want nothing. the flight line, they'll at least fly over so you have to get them to stop. 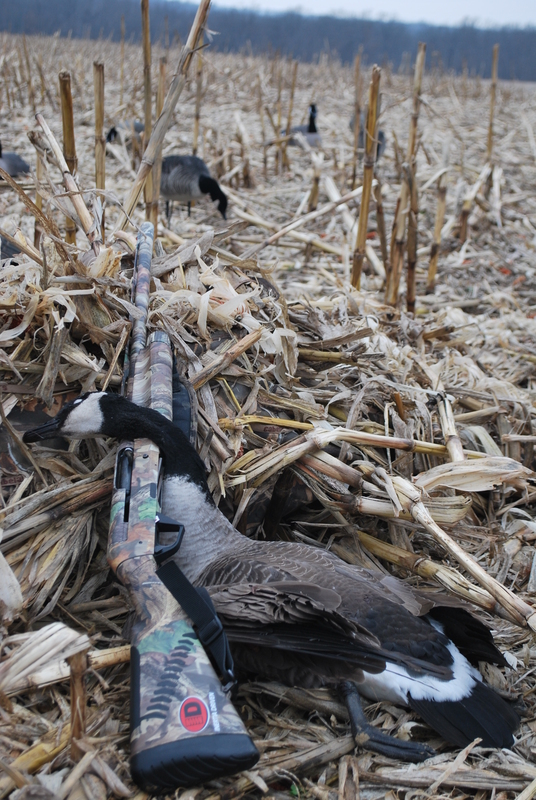 For more waterfowl hunting tips check out our other posts. It’s been a slow week of waterfowl hunting in south central Illinois. Nearly every day this week we’ve had temps in the 60s with a 20+ mph south wind. Definitely not conducive to waterfowl hunting. We managed to scratch a few out through the mild weather during the week and finally got into them pretty good this morning after the cold front passage and during a steady rain. Most of our birds are stale and very few mallards are around. We’re mostly killing green wing teal and really not seeing much of anything else. Torry’s first ducks on November 16. Through the warm weather this week, the ducks were flying the first hour of the day then shut down by 730. We have been seeing a few of the local geese feeding between 8-10, but they’re very weary being resident geese. The ducks today stayed pretty steady through 10. We had two mallards light before shooting light, only to leave before we had a chance, then the rest of the morning was filled with small groups of teal buzzing the pit. We shot well early then started to lose our touch. The day finished with a mixed bag of teal, a red head, and a couple local geese. It was nice to actually hunt with cooler temperatures and calmer winds that aren’t out of the south. With three days of rain in the forecast, we should have a little better luck this week than last!